I love to give the kids good home cooked food, but also like meals that don’t require a Cordon Bleu diploma and five hours of my time. Also, last year, I got into meal planning to help me save on time, money and waste. Oven-baked salmon is a dish that is very well received, ludicrously easy to prepare – I don’t ever remember following a recipe – and healthy (aside from me adding more butter than is necessary – mmm butter). 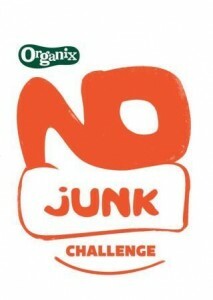 It’s also great for adults and kids alike, hence this meal occurs several times a month on my plan and why I think it’s great for the @Organixbrands #NoJunk Challenge. 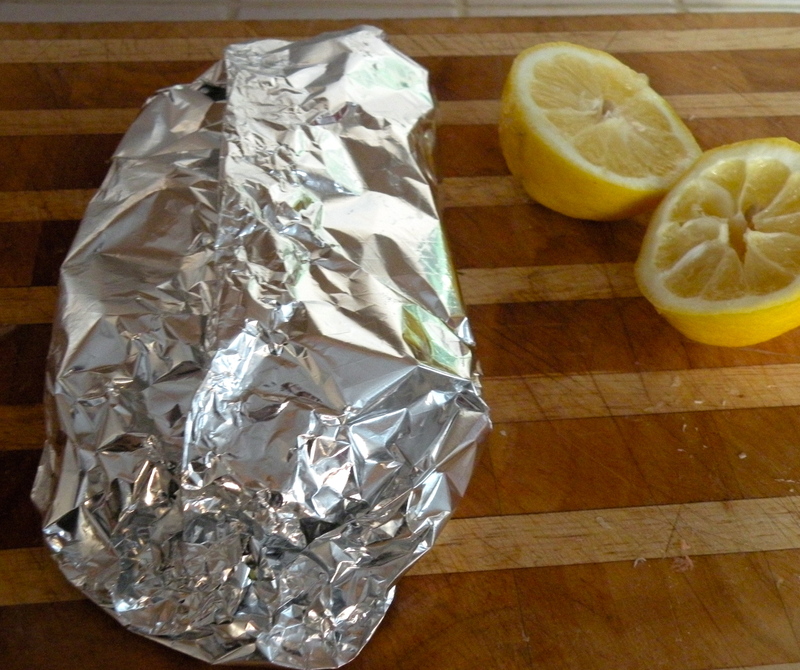 I have been sent a sample of Bacofoil Non-Stick Foil to try out along with some tips. However, this is the brand that I use anyway as I find it is far more durable than supermarket brands and is really good on the non-stick front. For one five-year-old and two, two-year-olds, and to make two meals (I’ll explain later), I use four boneless salmon steaks. I put two steaks onto two pieces of foil. I score the steaks, squeeze some lemon juice over, stick knobs of butter in the scored bits and add chopped shallots over the top (one shallot is enough for a good flavour). If I’m doing this for my husband and I, I add plenty of black pepper and some white wine. I then parcel it up and whack in the oven (pre-heated) at 180c for 25-30 mins (just check to see if it’s cooked through). The BacoFoil website shows how to make really neat double-folded foil packets. Mine are far more rough and ready, but they’ve always worked just fine. I usually serve with peas and sweetcorn or broccoli that I cook separately. However, a BacoFoil kids’ cooking suggestion is to make it colourful (and more simple) by letting them choose bright red and orange peppers, pieces of broccoli and baby corn for a fish or chicken parcel. My three all loathe peppers and aren’t huge fans of baby corn, but I’ve tried adding broccoli into the parcel this time. They also suggest letting the children open their own parcel at the table. The children liked doing this. However, I opened up the parcels a little first to let the steam out to avoid scolds. I don’t think broccoli was the best suited veg for the parcels as it was still a bit crunchy after 25 minutes. Although this was perhaps because my inferior parcels resulted in poor steam circulation! I always make too much, so the next day I flake the cold leftovers and mix into couscous along with broccoli or peas (whichever I haven’t used the day before). This makes a great hassle-free lunch. After being sent the sample I took a look at the BacoFoil website and found some great recipe ideas. 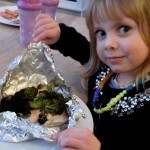 I’m definitely going to try out these: Tuscan Halibut Packets (the girls love beans), Cajun Sausage and Beans and Lemon Chicken Primavera, which includes another of the girls’ favourites: pasta. 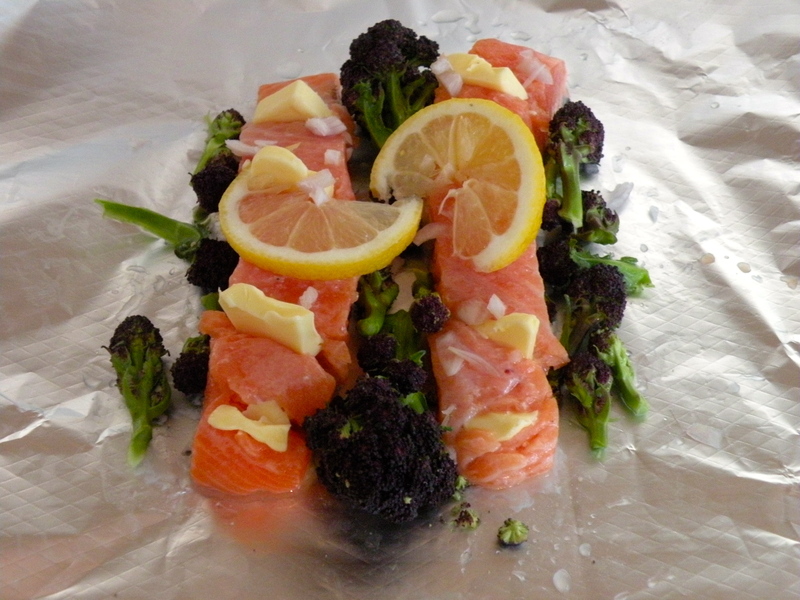 As soon as the weather’s warmer we’ll also be giving Steamed Herbed Salmon En Papillote on the BBQ a whirl. My spinach risotto is my five-year-old’s all-time favourite meal and the twins love it too. Fab way to get them to eat spinach as they’d NEVER eat it as a side dish! !